Daiwa’s new Air Rotation System also facilitates a smoother feel, effortless winding, and maximum free spinning rotation of the handle. 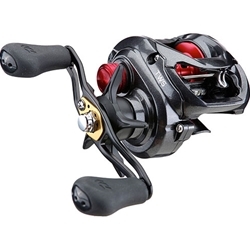 Also equipped with Daiwa’s smooth ultimate tournament drag system with 13.2lbs of max drag, a longer, stronger drive gear provides increased power, and the 90mm handle has been lengthened and out-fitted with over-sized grips for increased cranking power. Packed with cutting-edge technologies and tournament-caliber performance, the Daiwa Tatula CT Casting Reel is a beast on the water.